Tropical sleeping disease is caused by protozoan trypanosome that can be transmitted to humans by bites of tsetse flies. Covering the entire African village, she can suddenly disappear into thin air and just as suddenly back, hitting a lot of people almost simultaneously. Still could not figure out where it disappears and where once again strikes people for which analyses did not reveal any traces of trypanosomes. It appeared this time the disease was hidden literally under the noses of doctors and scientists, leaving the blood and being preserved as a skin disease. Researchers from Europe and the Congo, working headed by Annette McLeod (Annette MacLeod of the University of Glasgow, pointed out that after the remarkable successes that have been achieved in the fight against trypanosome in the middle of the twentieth century, the incidence of them fell to 7-10 thousand cases a year, almost always fatal. Given the fact that the risk area is home to more than 65 million people, it is quite small, but the doctors could not get rid of these last thousand. The paper used is of archival history and materials biopsies of men who underwent treatment in the clinics of the Congo in the first half of the 1990s. In the skin of some Macleod and her colleagues had detected the presence of trypanosomes, although at the time of treatment did not notice them and no characteristic symptoms, these patients did not show. In experiments on mice it was shown that parasites can settle what the skin and, moreover, spread by the flies from the skin-to-skin. Strictly speaking, this propagation mechanism has not been demonstrated, but the authors believe that the skin is “undervalued reservoir” trypanosomic infections. 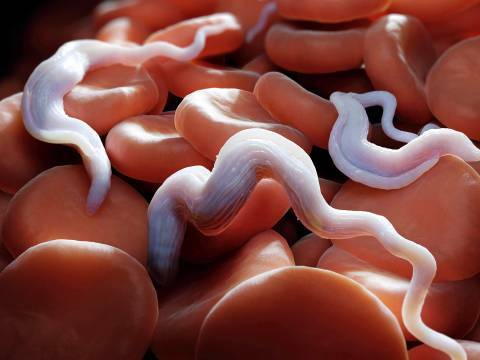 It is in the skin, apparently, hiding an infection in those periods when she stops to show up and Express themselves with bright symptoms, because doctors still test for the presence of trypanosomes only blood samples. Now, finding the secret lair of the enemy, doctors can deploy the final attack on the deadly sleeping sickness.